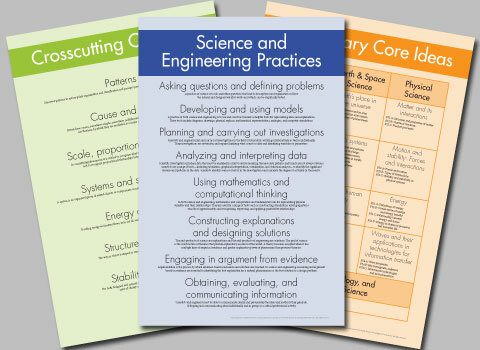 Because of high demand from teachers, we're providing a set of three posters that highlight the three NGSS strands: Science and Engineering Practices, Crosscutting Concepts, and the Disciplinary Core Ideas. We are unable to print or sell these posters, but free high-quality PDFs are available for you to download and take to your local print shop. We recommend printing each poster full size at 24" by 36" (61 cm by 91.5 cm), but they can also be printed at smaller sizes. Update June 30, 2015: We added an improved poster design with the large text only. Disclaimer: Text adapted from the NGSS Appendices E, F, and G and is © Copyright 2013 Achieve, Inc. All rights reserved. Neither Achieve nor the lead states and partners that developed the Next Generation Science Standards was involved in the production of, and does not endorse, this product.